I love every single thing about The Baby right now. I want to hang on to this forever. I love the way he sleeps in his big boy bed now. I love the way he puts S's in almost all of his words. 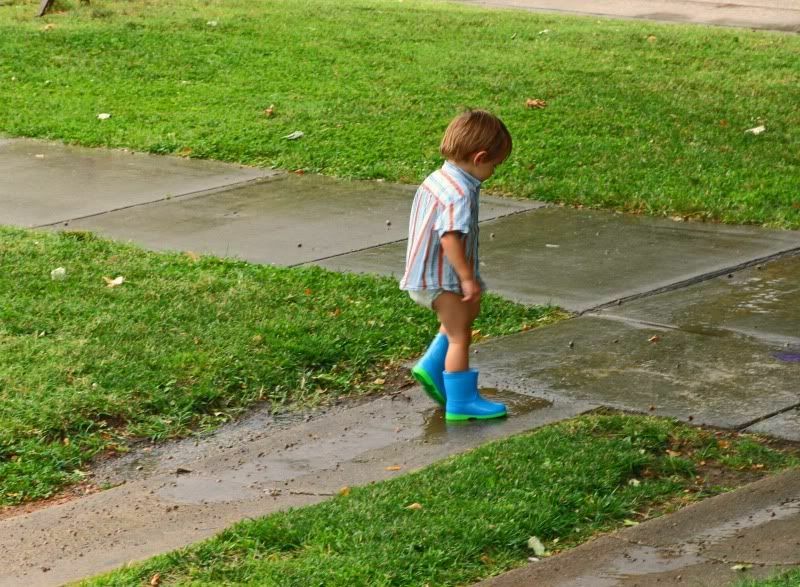 I love that a rainshower is cause to put on boots (on the wrong feet) and go splash in puddles regardless if he's wearing any pants. I love how much he loves trains and asks 30 times a day to see a "train coming?!" I love the way he bats his eyelashes and flirts with strangers at church or the store. I love the way he always has to eat marshmallows in pairs. One alone is never right. He must have one for each hand. And he loves marshmallows! I love the way he rarely says I or Me, but refers to himself in the third person. I love how he hugs so tight and doesn't let go until I force him to. I hate doing that, but after 5 minutes of a bear hug, sometimes I really do have to get on with other things. When the phone rings he runs full speed screaming, "I dot it!!!" I love how he drives the dining room chairs (all 6 of them) around the house pretending they're trains. Okay, I don't really love that, but I know it's something I'll look back on and laugh. When we go grocery shopping, he yells "Choo Choooooo!!!" so loud it echos through The WalMarts and causes strangers to come see what is going on at my cart. People always laugh and think it's hilarious. I love when he gets excited about something how his eyes sparkle and he nods his head while he's telling someone about it. "See dat, mommas?!" He knows a little "pweeeease" will get him anything he wants. "Mommas, ice cweams pweeease..."
At this moment I love this child so much it hurts. I want to hold on to this moment for just a little bit longer. Awww, I know what you mean. They grow up too fast and you turn around and wonder where they went. My 3 1/2 year old loves to hear about things he did when he was "a baby," and I keep thinking, but you still are a baby!! I bet he enjoys his time with you while the girl and boy are at school. He's so cute! i can so relate to this post. my little guy is 3 1/2 and i'm hanging on tight. he's adorable by the way :) have a great week & thanks for visiting! Luke LUBS me too!!!!!!!!!!!!!!!!!!!! "I LUB YOU MAMA"....Oh, how I NEVER want him to NOT say that. I swear to my husband that none of my kids LUB me the way Luke does. But he is the baby. He's so precious! I don't blame you for wanting to stop time. Such a cutie! Aww Beki! What a sweet post! What a sweet post. I know how you feel. My oldest baby starts 1st grade tomorrow, my middle baby starts preschool next week, and my youngest baby is growing up way too fast for me too. How time flies!!!! How does he say Marshmallow? I say smarschmallows, just because I like to. Always. Unless I say shmarschmallows. I just like that word. and I like your Baby. Nawww - I love it when they're in the not wearing any trousers stage. Gosh. This American vs British speak is confusing! our "pants" are your underwear! So sweet. Time is moving too quickly, I agree. 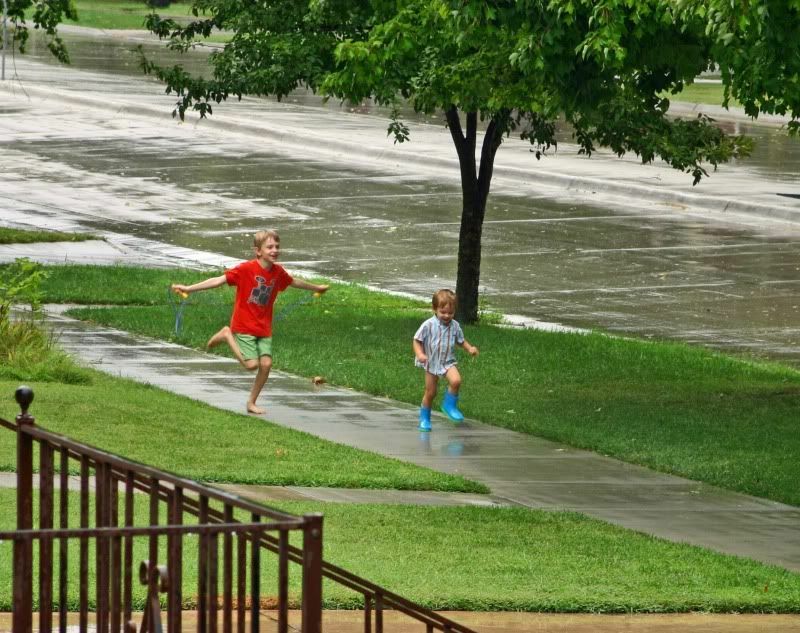 And he is rockin' those rain boots. I can RELATE! It is so hard to know that my baby is my last! Beki, I think you made my ovaries quiver. Oh dear. 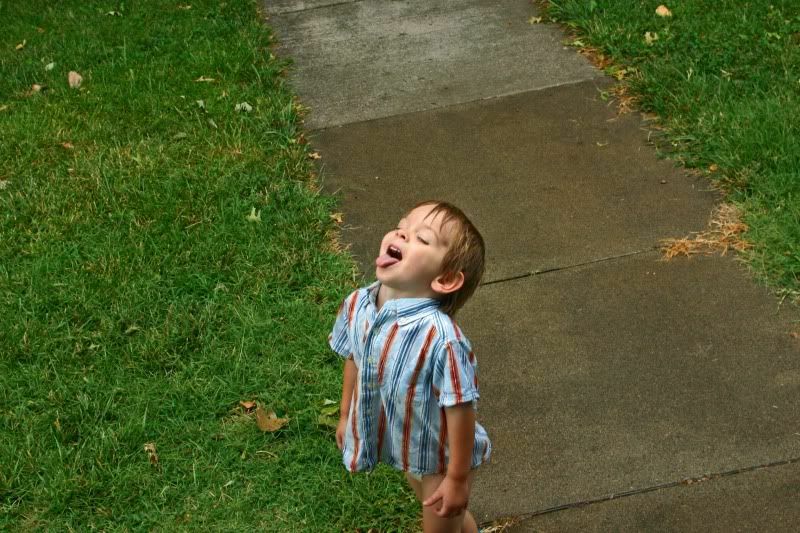 He is ADORABLE... and 'watersmelon' is the cutest thing I have ever heard!! Indeed =) how precious! thanks for sharing the memories and the beautiful pictures! He just gets cuter and cuter. 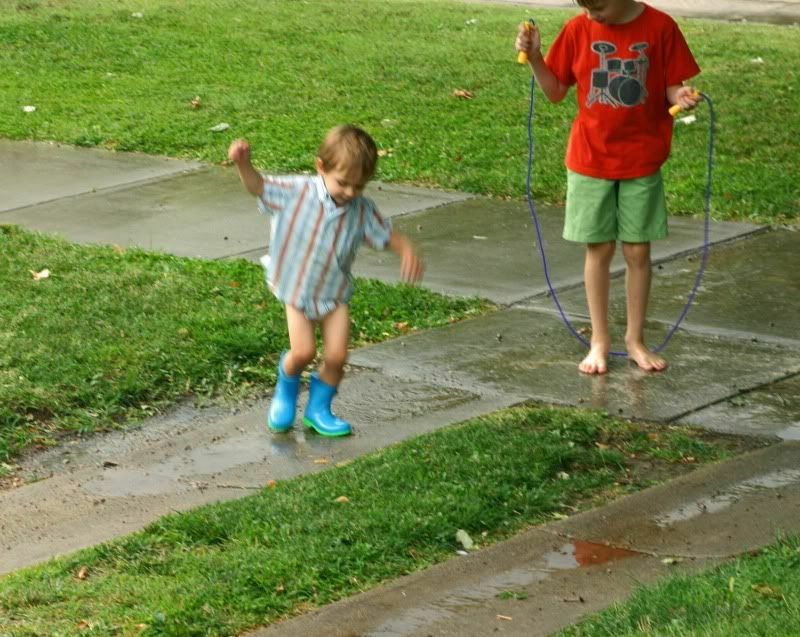 I love the boots with no pants...total spontaneity! They do grow up so fast. So glad you are savoring each and every moment! These times are so special, it goes waaay to fast. So sweet, Beki. I love this age too! Yes, it goes by sooo fast... and yet, somedays, it seems to drag by too slow, why is that?? Thank you for that wonderful perspective. You are killing me here. My baby just turned two on Sunday and I know it won't last much longer. It's bittersweet, isn't it? What a sweet post! He is just precious. They sure grow up fast. I'd love to freeze my 19 month old at this exact age for a while. Sometimes I think you are blogging about my Kid. 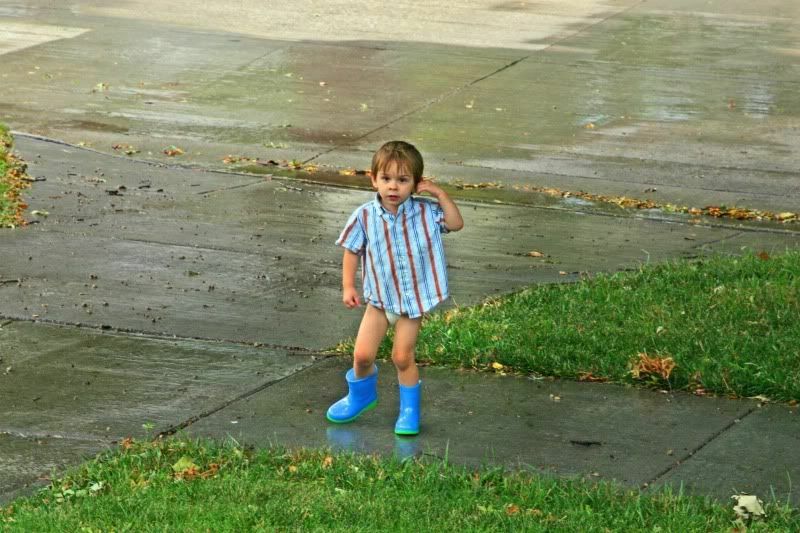 Wears rains boots with no pants? Check. Obsessed with trains (or anything with wheels)? Check. Is insanely adorable and thus can get away with being very naughty? Check. Likes to double-fist his snacks? Check. The only difference is that my Kid is about six months older than your Baby. Not that it makes him any more mature or wiser or anything. It just means he has a wider vocabulary with which to sass me. Sooooo true!! What a special time! Ah, that made me tear up a little bit. So Sweet, I totally understand! And seeing those pictures makes me want to hug on him.